A solar powered cabin on a cacao and tropical fruit farm in Hawaii. Doesn't that sound like paradise? I want you to know more about our stay in beautiful Hawai'i. 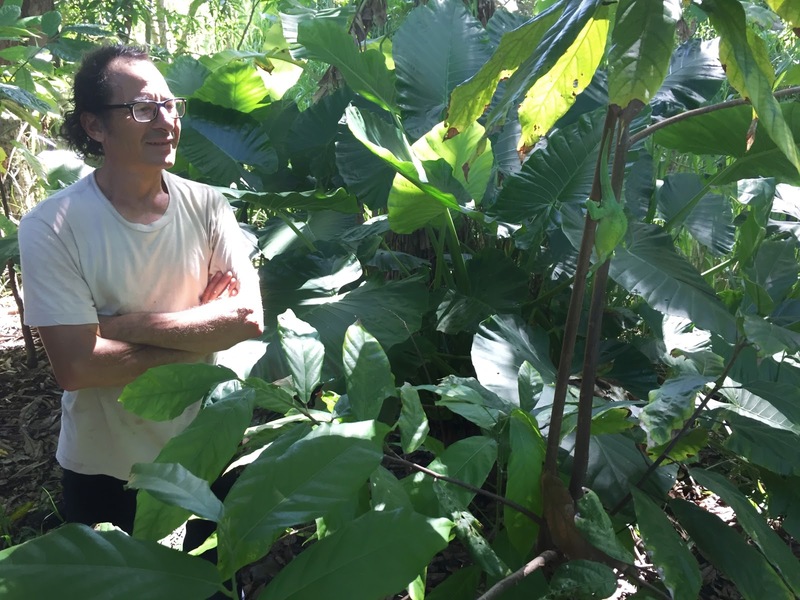 It all started when a chocolate maker and cacao grower named Josh Yang started chatting with me on Instagram. When Josh told me he had an Airbnb on his tropical fruit and cacao farm, it didn't take me long to book it. Welcome to the cabin on The K Farm, home of Pa'aulio Chocolate. What we found was beautiful simplicity in a rural setting. Exactly what we needed! From our covered front porch we had an expansive view of the Pacific Ocean. Occasionally ships would pass by in the distance. I enjoyed cacao tea every morning watching the colors of the sunrise over the ocean. 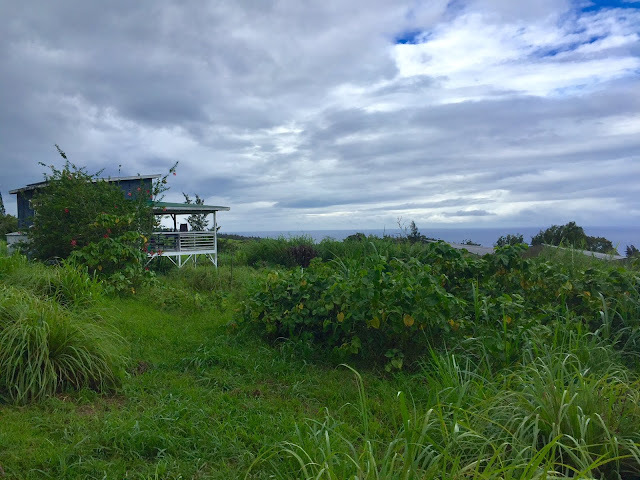 Chocolate tea every morning on the front deck overlooking the farm and Pacific Ocean. 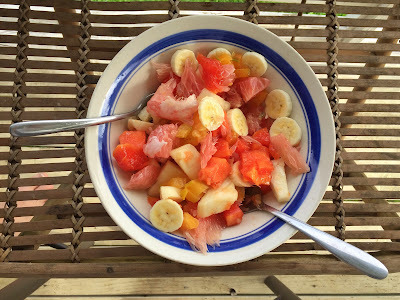 Our breakfast was usually fresh fruit from the farm, almost always enjoyed on the porch with the view. Just look at those amazing colors! No filters needed! Dinners or drinks at night, again on the porch, the sky filled with stars above. The sounds on the farm provide an audio experience that filled my head with soothing sounds, compared to the sirens and traffic I often hear in the city. As the tropical trade winds blow through the trees and plants whisper while the giant bamboo knocks together in the distance. The birds are constantly busy. At night frogs and crickets sing. The there is also the occasional cow or donkey from neighboring farms, and the roosters calling every evening and morning. Evening sounds from the frogs (that sound like birds) that sang us to sleep every night. 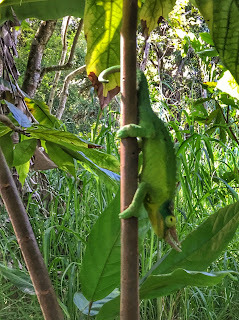 One day while Josh was showing us around we came across this three horned chameleon on a cacao tree. Look closely, it's actually quite large. 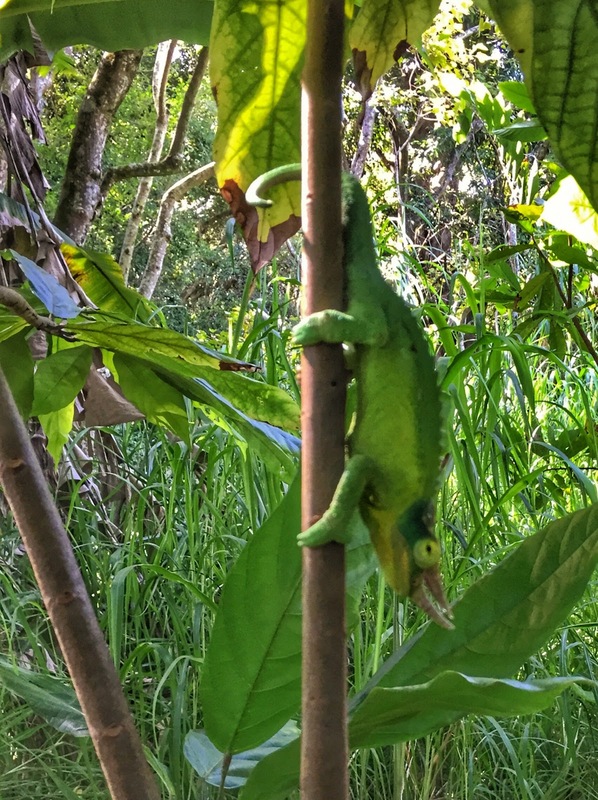 Three horned chameleon on a cacao tree. Staying on a farm reminded me how hard farmers work. Up before dawn, working all through the day, and well into the evening to grow, harvest, and then sell produce. We watched Josh dig kava, a back breaking process performed in the heat and humidity. He talked about making calls at 2 or 3am to catch the buyers on the east coast of the mainland for his turmeric. The tall grass grows so fast that you can practically watch it, and with natural farming practices there is a constant battle to keep it from taking over the crops. Farms also require fencing and gates to protect from the wild boar to keep the boar from digging up trees and produce. 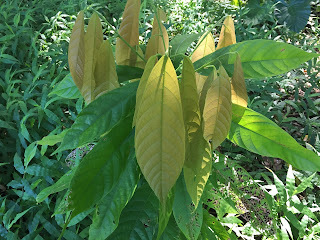 Young cacao tree on the farm. 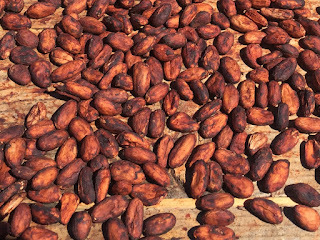 Drying cacao on the farm. Some days we just hung out, reading, tasting chocolate and watching the view, but most days we took trips to visit other parts of the island, the volcano, lava tubes, beaches, ancient ruins, and many hikes. We even connected with some friends who have moved here to enjoy the laid back lifestyle and gorgeous scenery. I don't blame them at all, it is truly a beautiful place to live and the pace is chill. Staying on the farm is a completely different experience than staying at a resort. Resorts are also beautiful with impressive architecture, and feature the conveniences of a spa, or a pool with a fruity tropical drink to relax. We pressed fresh cacao juice right on the farm. What we found with the simplicity of the farm experience is a refreshing reminder of how little we really need to be happy and how many things can complicate life unnecessarily. It was also a reminder that behind everything that we consume, there is someone who has been cultivating, tending, or crafting, sometimes for years, usually with very hard work. This was a fantastic experience and I''m so very grateful for the perspective gained. Leaving the farm, my stress levels were about 25 points lower than when I arrived, I was reacquainted with the beauty of simplicity, we reconnected with our love of nature, and were reminded not to take anything for granted, because someone put in the hard work and effort to make it happen. You'll certainly meet Fairy the charming cat. She really owns the cabin and makes everyone feel welcome. P.S Now that I'm back home in Seattle, most mornings I continue my tradition of chocolate tea, and it all started on the K Farm in Hawaii.